On Monday, a mother called the Metropolitan Tenants Organization’s hotline because her son had stood up and laughed during a high profile criminal case after the judge had warned the crowd that no interruptions would be tolerated. The judged then ordered her son who has a mental illness into custody and sentenced him to 40 days in jail for criminal contempt of court. It is difficult to imagine that sentencing a person with a bi-polar disorder to jail for his laughter will have any positive outcomes. Already, ramifications are being felt that extend beyond the 40-day sentence. His mother called our office because the onsite manager of her son’s apartment building was evicting her son because of the arrest. When his mother tried to tender the rent, the manager said, “No! Get out!” Her son had lived in the apartment for 15 years. This means that when he gets out of jail he will have no place to call home. This is one more devastating blow to an outburst of laughter in the courtroom. While all this may be within bounds or our “justice” system, the end result is cruel and inhumane. It is not difficult to predict what will happen next. With an eviction on his record and a criminal conviction, few, if any, landlords will rent him an apartment. 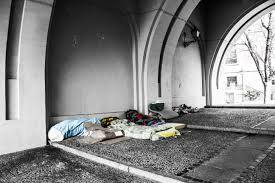 Thus without intervention, we will end up with another homeless person on the streets of Chicago. These circumstances are unique, but it is a situation faced by all too many people. This is but one of many examples of how a person can get caught up in events that quickly spiral out of control. We live in a very unforgiving system where housing is more of a privilege than a right. MTO has partnered with the Lawyers Committee for Better Housing to start an eviction prevention campaign. We are attempting to negotiate a reasonable response, which will allow this individual to stay in his home. Stay in touch. Tell others about this case and consider becoming a hotline volunteer so that you can help tenants and be a part of humane response to problems that focuses on keeping people in their home. June is National Healthy Homes Month… Do Those in Power Care? June is Healthy Homes Month. The need to recognize this month poses the question: do policy makers, CEOs and property owners really care about people’s health or the housing they live in? US health care expenditures totaled $3.3 trillion in 2016. This massive spending really did not help Tolanda McMullen’s family, especially her son who was severely poisoned by the lead paint in their Chicago home. Tolanda was shocked by her son’s poisoning as she felt lead was an issue of the past. It Is not and the poisoning haunts her family to this day. 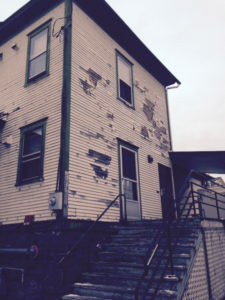 “My son will be forever impacted by lead and what is worse is this could have been prevented.” The sad fact is that so many illnesses, poisonings and hospital visits could be prevented if people’s homes were safe, healthy and affordable. In the case of Tolanda’s son, all her landlord needed to do was to follow lead abatement protocols and repair the lead tainted windows. Profit won out. Window replacement is expensive. The landlord rented her an unhealthy and unsafe home because he could. After all, the assumption is that low-cost housing has problems otherwise it would not be low-income. This flawed belief is allowed to continue by policy makers and political leaders who excuse substandard conditions by saying that government cannot afford to do better. For the entire month of June, MTO will tweet, write, photograph and otherwise scream out over social media to demand action on the part of public officials and property owners. No child should ever be poisoned by lead from their home. No child should miss school because home-based hazards triggered a child’s asthma. We ask you to support this campaign to forward these messages and images to friends, aldermen, the mayor, the governor and the president. In the end, there is nothing more important than our health and having a safe decent home in which to live. Posted in Healthy Homes, Latest NewsLeave a Comment on June is National Healthy Homes Month… Do Those in Power Care? 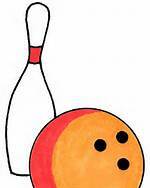 MTO Board, staff members and friends will participate in the 26th Annual Bowl-a-thon fundraiser. • Join a team – Can’t find three friends to bowl with – call Clarissa (773.292.4980 ext. 222). She will put you on a team. Then start collecting pledges. • Be a Bowl-a-thon Booster – So you can’t bowl but you still want to join in on the fun? Be a Booster! Grab a pledge sheet off the website and start collecting pledges. Boosters are entered in a special category to win a prize at the event. • Make a donation – If you want to support the effort but are unable to attend the event, go to www.tenants-rights.org and click on Bowl-a-MANIA 2013. There you can make a donation to help support our efforts to raise $8,000 this year. • You must be registered to participate. Call Clarissa at 773.292.4980 ext. 222 and register as a team, extra bowler or booster. She’ll give you all the details. • Any bowler or booster must raise at least $75 to bowl free, get free rental shoes and enjoy pizza and soda for dinner. WE HOPE YOU RAISE MUCH MORE but you must raise at least $75 or pay for your bowling and dinner. • Visit the website at www.tenants-rights.org and click Bowl-a MANIA 2013 to find your pledge sheets and make donations. • We will bowl three games per team. • There are lots of prizes. • We’ll have tons of fun. • You want to be there! Download a pledge form below…..
Posted in More headlinesTagged bowl-a-mania, bowl-a-thonLeave a Comment on MTO Launches 2013 Bowl-a-MANIA! 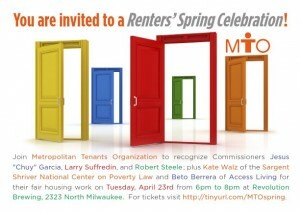 On April 23rd, 2013 Metropolitan Tenants Organization will host our annual Renters’ Spring Celebration at Revolution Brewing 2323 N. Milwaukee 6-8 pm. Good food, good music, good times and good networking. Last year’s event attracted more than 100 Chicagoans. This year, the event commemorates the passage of what has come to be known as the “Fair Housing Act” of 1968. 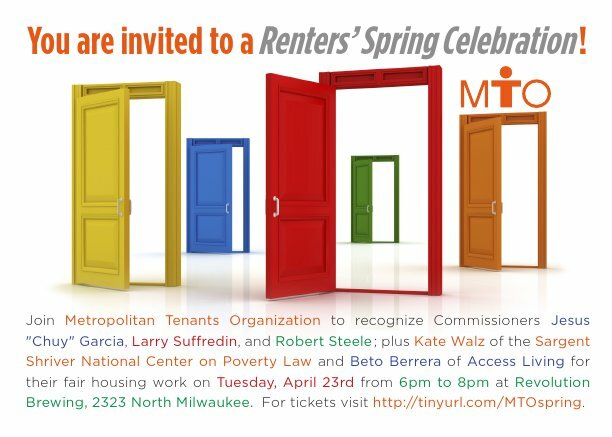 Cook County Commissioners Larry Suffredin, Jesus “Chuy” Garcia and Robert Steele, as well as Kate Walz of the Sargent Shriver National Center on Poverty Law and Beto Berrera of Access Living, will be recognized for their work for housing justice. At this year’s event, MTO plans to lift up the voices of Chicagoan’s who have been a part of the struggle for housing justice over the years and renew the call to action to work toward safe, decent and affordable housing for everyone. We hope you will join us for what is sure to be a fun & memorable evening! Top Sponsors – Gold Level: Law Offices of Hall Adams LLC *** Silver Level: Illinois State Senator Heather Steans & Leo Smith. THANK YOU! Posted in More headlinesTagged metropolitan tenants organization, renters' spring celebrationLeave a Comment on Renters’ Spring Celebration 2013! 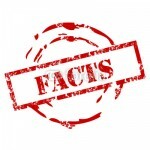 • The Cook County Human Rights Ordinance (CCHRO) currently protects individuals from discrimination on the basis of a person’s source of income (i.e., child support, social security). The CCHRO however specifically exempts from protection persons with “Section 8” Housing Choice Vouchers. Presently housing providers can and do deny qualified households solely because they have a Housing Choice Voucher. Studies have shown that housing providers often refuse to rent to voucher holders as a pretext for other types of illegal discrimination such as race, familial status, and disability. • The proposed ordinance amendment would include in the protection against source of income discrimination persons with Housing Choice Vouchers. The amendment would not force property owners to rent any or all of their units to any households using Housing Choice Vouchers. Property owners will still have the right to screen applicants. • The City of Chicago and six other municipalities in Illinois, ten states, the District of Columbia, and ten counties around the country have laws that protect individuals from discrimination based upon the use of a Housing Choice Voucher. • Voucher holders are some of the most scrutinized tenants and must meet the rigorous admission criteria of the voucher administrator as well as comply with lease provisions. Nearly 40% of voucher recipients are employed and more than 30% are seniors or persons with disabilities. There is absolutely no evidence that persons who use Housing Choice Vouchers to make their housing affordable perpetuate or increase crime in communities. • Landlord participation in the voucher program is not unduly burdensome. Landlords only have to complete three simple forms. Payments made by the housing authority are made electronically. Units must pass a Housing Quality Standards inspection. Voucher recipients have to complete most of the paperwork. • By supporting this amendment to the CCHRO, the last remaining type of source of income discrimination in Cook County can finally end. Mayor Richard Daley today angrily rebuked real estate groups that he said helped stop his plan to protect renters whose buildings are converted to condominiums. Daley’s renter protection proposal failed to get a vote from the City Council, which sent the package back to committee for further consideration. After years of advocating for changes renters and condo buyers are on the verge of winning significant rights when an apartment building is converted to condominiums. MTO tenant leaders have played an important part in getting the ordinance before the city council. MTO began its condo conversion campaign in 2005 when large number of tenants began calling the Hotline. 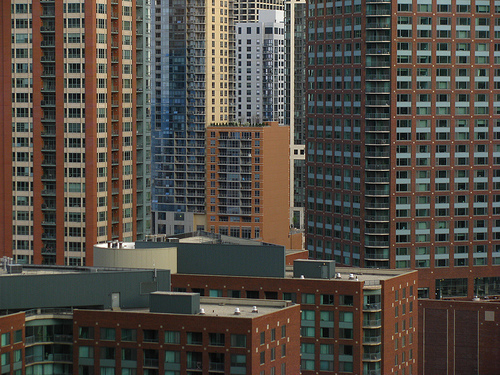 Many tenants were receiving 30-day notices of termination of tenancy in violation of the Chicago Condo Ordinance requiring a 120-day notification when a landlord is converting a building. Unscrupulous developers take advantage of loopholes in state and city laws to do “stealth” condo conversions. MTO brought tenants and community residents together to confront the problem. A march and rally was held on September 30th , 2006. A demand was made for public officials to address the dilemma renters are put in when developers attempt stealth conversion. Ald. Preckwinkle and Ald. Hairston attended the rally. The rally caused the Mayor to convene the Mayor’s Condominium Conversion Task Force on October 23rd 2006 to address the issue. Although the Task Force was formed they would not hold a meeting for almost a year. 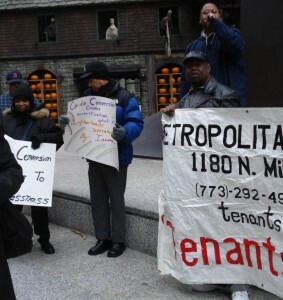 In September 2007 MTO along with tenants and organizations from across the City held an action in front of City Hall to demand that the Mayor’s Task Force on Condo Conversion meet. The action led the Task Force to begin holding regular meetings. MTO leaders attended every meeting and testified to the need for a renter to be appointed to the Task Force. After months of work, tenant leader, Elizabeth Todd, was asked to join the Task Force to address the needs of renters. The new ordinance is a result of their recommendations of the Mayors Task Force on Condo Conversion and the input of tenant leaders from across the city working with MTO. The ordinance increases the time of tenants to be notified from 4 to 9 months. It requires relocation assistance of $1,500 to renters being displaced. The ordinance also establishes a Condominium Registration Program for new and converted condos. We at MTO would like to thank the Mayor, Task Force chairman, Alderman Ray Suarez, all the members of the Task Force and the hundreds of tenants who worked hard to pass this ordinance. Across our television screens and on billboards throughout the city announcements about that the 2010 Census are springing up. The campaign for census participation is one of the biggest in the history of the census. Why? Because there is a significant effort underway to make sure that those of us who have not been counted in the past are included in this year’s census count. The mantra, “Be Counted!” attests to this central focus of the 2010 Census campaign. Recognizing that renters are among those who have been undercounted in the past, MTO has engaged the 2010 Census as a Count-Me-In partner. Count-Me-In is a campaign funded by ten of Illinois’ leading philanthropies, including The Boeing Company, the Chicago Bar Foundation, The Chicago Community Trust, the Lloyd A. Fry Foundation, Grand Victoria Foundation, the Joyce Foundation, John D. and Catherine T. MacArthur Foundation, Polk Bros. Foundation, Steans Family Foundation, and Woods Fund of Chicago. In addition, LISC/Chicago is supporting five New Community Program lead agencies in this effort. The Joyce Foundation has awarded separate grants to the Leadership Conference on Civil Rights Education Fund, the Illinois League of Women Voters, the Mexican American Legal Defense Fund, and Citizens Advocacy Center for census related work in Illinois. An accurate census count is imperative to establishing benchmarks in our communities to guide government funds. When decisions are made regarding how many subsidized housing vouchers a community should receive, census numbers are consulted to determine levels of need. When decisions are made around where to place subsidized and affordable housing, census numbers determine which communities benefit. Everything from the amount of money allocated to fix potholes in the street to the funds allocated to benefit your local schools is determined, in part, by census numbers. If a community is undercounted, that community will lose funding and representation for years to come. Undercounts can mean the difference between your community flourishing and your community wasting away. Beginning in March, households across the country will begin receiving their census forms. Ten short questions to help determine the future. This is your chance to say, “I matter!” Step up and BE COUNTED. 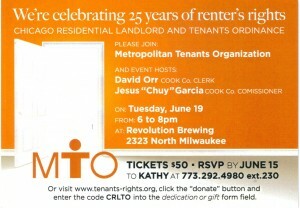 MTO is hosting a raffle for all renters who attend an MTO meeting in March and do one of the following: bring a sealed envelope with your census forms enclosed that you are preparing to mail, bring a photo-copy of a sealed envelope that you have already mailed or bring your forms to fill out at a meeting. Any of these activities will earn you a raffle ticket – making you eligible to win one of three cash prizes – $300/first prize, $150/second prize, $50/third prize. Raffle winners will be announced at the April Community Congress meeting. Remember, your census responses are completely confidential. If you have any questions regarding the census, consult the 2010 Census website at: www.2010.census.gov. At MTO’s 2007 Citywide Tenants Congress, tenants identified poor building conditions and slumlords as one of its three key issues. Tenants proposed several ways to increase landlord accountability. One way was to hit landlords where it counts in their pocket book. The Chicago City Council at its January 2010 meeting took an important step in affirming tenants’ rights to safe and decent housing by passing the Building Code Scofflaw. Alderman Leslie Hairston introduced the ordinance, in May 2007. The bill targets landlords who have uncorrected code violations that are habitual, extensive or serious. These landlords are the worst of the worst and fit the term slumlord. This ordinance would prohibit slumlords from doing any business with the City of Chicago. While it is unknown how many owners this bill will impact. It does send a message to owners that if you own property and want the City’s business you will have to keep your buildings up to code. Counselors take calls on the MTO Hotline. On December 17th a tenant residing at 634 N. Ridgeway called the Metropolitan Tenants Organizations (MTO) hotline in regards to no heat. The tenant was referred to MTO organizers who immediately went to the building. The tenants believed that the landlord had purposely turned off the heat in response to late payments on rent. The tenant had recently lost her job and was unable to pay her rent in full. Organizers had the tenant call 311, get the 311 reference number and write out a 24 hour Heat and Essential Service letter to the landlord. Organizers also contacted attorneys for the City of Chicago to complain about the lockout. On the following day the tenant sent a letter to the landlord warning of the consequences of a lockout along with the 24 hour letter demanding the immediate restoration of heat and sent the certified mail. The landlord refused to restore the heat. On December 22nd building inspectors came out to the building and found it to be not compliant and in a dangerous and hazardous condition. Still the landlord refused to restore the heat. MTO worked with the tenant and the Corporation Counsel to document that this was in fact an illegal lockout and that the gas was intentionally shutoff because he wanted the tenants out. On December 29, the tenant with MTO organizers appeared in Housing Court in front of Judge Clay-Clark. 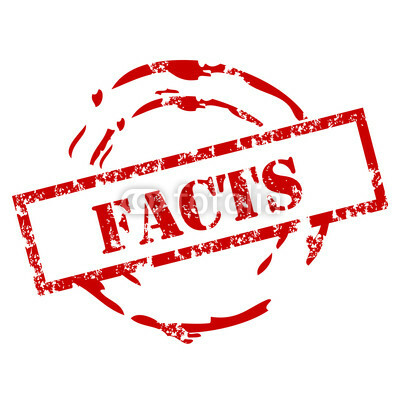 The landlord tried to deny responsibility for the shutoff but the evidence was on the tenant’s side and the judge ruledthe landlord was non compliant with city code, was found to have been interfering with utility services, and having committed a lockout on the tenants. As a result a receiver was placed in the building to work with the tenant in restoring the heat immediately to the unit. Hopefully this will send a message to landlords that lockouts are illegal. A follow up court date was set for January 19th 2010.